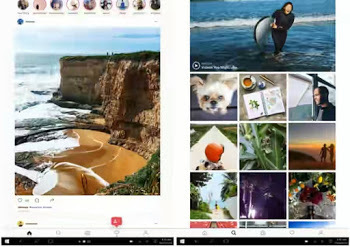 Finally, those using windows 10 can now enjoy what they have been missing for long now, as Instagram app is now made available for all users of windows 10 to download. The app is presently available on windows store. Hey don't be bamboozled about what I said, as in the app not being enjoyed for long for those using PC. But the very fact is just that, we have been using Instagram but through the help of third party apps and via web-based instagram platform. So to have it, the main official application is ready and made available for all PC users. The newly introduced instagram has all it takes to be called a PC application. Having the app installed on your pc, you can easily upload pictures directly to the Instagram from your PC camera roll folder, as well as being able to get notifications, chat via Instagram Direct, and of course use Stories, Search, Explore, Profile, and Feed etc. The only bug in the app for now, is that it crashes whenever one try to add a story, especially if you are the type using a PC without a backward-facing can. So we are hoping that their subsequent updates on the app will be able to fix the bug in future. To Download Instagram For Windows 10 click Here.